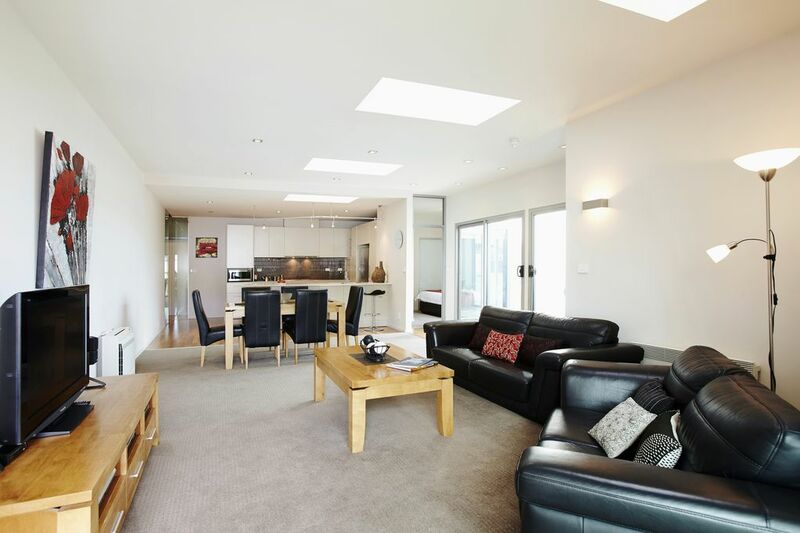 New spacious apartment in the heart of Hobart, large balcony, modern and vibrant furnishings, 3 bedrooms, air conditioning and well equipped throughout. The kitchen services an impressive entertaining/dining area flowing out to the sunny expansive balcony with city and mountain views. The apartment is located on the 2nd floor and have direct lift access and security. Free off-street parking is also provided. The apartments are a flat 7 minute walk into the city or waterfront. The apartment provides accomodation for up to 6 guests in 3 bedrooms. All bedrooms have Queen Beds complete with luxurious linen and 2 bathrooms with walk-in showers. This apartment is the perfect accomodation in Hobart with all the comforts of home in a great location to enjoy all that Hobart has to offer! Very clean, neat, and had a range of condiments. Fabulous apartment, had everything we needed for our stay. Spacious, bright and comfortable. Thank you - glad you enjoyed your stay. The property was modern, clean and relatively large. There are three bedrooms, one is separated from the others being across the lounge room and the other two share access to a bathroom. The kitchen was modern and well stocked with normal requirements and the property had a full laundry facility. We found the location good, being a short walk to the cafe restaurant precinct of North Hobart. The walk to the waterfront was a pleasant 15 minutes sightly downhill but coming back might tax some people but we did not find it an issue. We did a lot of day trips from Hobart and we found it ideally situated for that being close to the major thoroughfares out of Hobart. Bedrooms weren't big but more than adequate and the beds reasonably comfortable. We would stay there again that being said the property lacked any character and those little things that would have made it a great stay and would probably first consider other properties to see what is avilable. If you are looking for a clean, modern well-located property of reasonable size than this fits the bill..
We recently had a very pleasant stay. Apartment was clean, comfortable, spacious and well laid out. Thank you. Excellent accommodation! Spacious, modern, clean, good location.